Dexion Protex is a propriety barrier rail system which is available in a number of configurations to include welded low level barrier systems 380mm high. This consists of welded posts painted in high visibility Yellow with black plastic top caps. 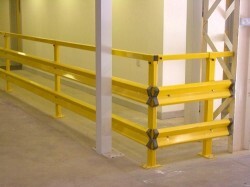 The rail is constructed from a compressed E-rail for strength and is painted in high visibility Yellow. Route Separator is an 1100mm high barrier system consisting of a top box section handrail and 2 lower levels of E-rail barrier. The complete route separator barrier system is painted high visibility Yellow. The route separator is an excellent form of segregating areas where people are walking to allow for safe management of fork truck and handling equipment. The route separator is particularly visible as being 1100mm high it is clear to fork truck drivers as well as personnel. Hampshire Mezzanine Floors can customise a barrier system to suit your specific needs. We often provide barrier systems with box section posts and profiled barrier rail. Hampshire Mezzanine Floors design a system which incorporates a lower level smaller 40 x 40 box rail located below the barrier rail for stopping smaller impact from trollies or pallets, as well as the higher rail mainly for fork truck impact protection. 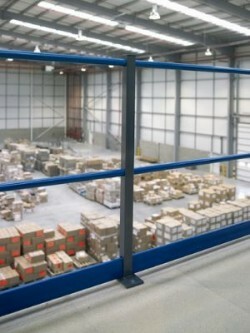 Hampshire Mezzanine Floors can provide the barrier system posts to suit any BS or RAL colour you require. Hampshire Mezzanine Floors fit box section double tubular hand and knee rail to our mezzanine floors and to any exposed perimeter of customers existing raised area. Hampshire Mezzanine Floors handrail systems are 1100mm high with box section posts spaced at approximately 1500mm centres with tubular hand and knee rails. Hampshire Mezzanine Floors usually fit kickboard to this handrail system to satisfy European legislation. Hampshire Mezzanine Floors hand and knee rail can be painted a number of BS or RAL colours to suit your requirements. Industrial warehouse barriers are not only used for protection of racking, machinery and pedestrians, but they are also positioned to identify designated pedestrian walkways and workspace. We do an extensive range of warehouse barrier systems, including pedestrian barriers, crash barrier, route separator bollards, traffic barriers, steel warehouse barriers and posts. It is designed to be high visibility, usually yellow and can have low, high or dual barrier rails. Hampshire Mezzanine Floors also supply and install rack protection barrier systems, designed specifically to protect from fork truck impact damage. This is also known as crash barrier. On pallet racking installations, anti-collapse mesh can also be used as a barrier system to stop product or pallets falling off the racks, resulting in loss of stock, or more importantly what could be a serious accident. 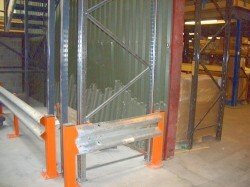 Column guards usually bolted to the ground around the uprights on a pallet racking installation. Again, this is to protect your racking from impact damage, which could end in a rack collapse. As well as racking protection, it is recommended that you have your pallet racking inspected annually as general maintenance. Armco barrier can be fitted both externally and within the work place. Armco barrier is available in a large range of profiles and sizes from the heavy duty barrier system like you see on motorways, to light duty smaller sections that are fitted in the warehouse. Upright members can either be of fixed or sprung construction. Sprung construction can be a way of minimising the damage to both the barrier system and the chance of the impact as the barrier will effectively be allowed to make a small amount minimising the impact. Fixed barriers can either be sunk into the ground or more commonly fixed using anchor bolts into your existing flooring. Armco barrier standard finish is hot dipped galvanise. To find out more about all the barrier systems we can provide, please contact us today to discuss.